PHOTO BY SO-MIN KANG Michael Christie is guest conducting the RPO this week. The Rochester Philharmonic Orchestra on Thursday performed a rare, Baroque-heavy program with holiday overtones, and the results were close to perfection. 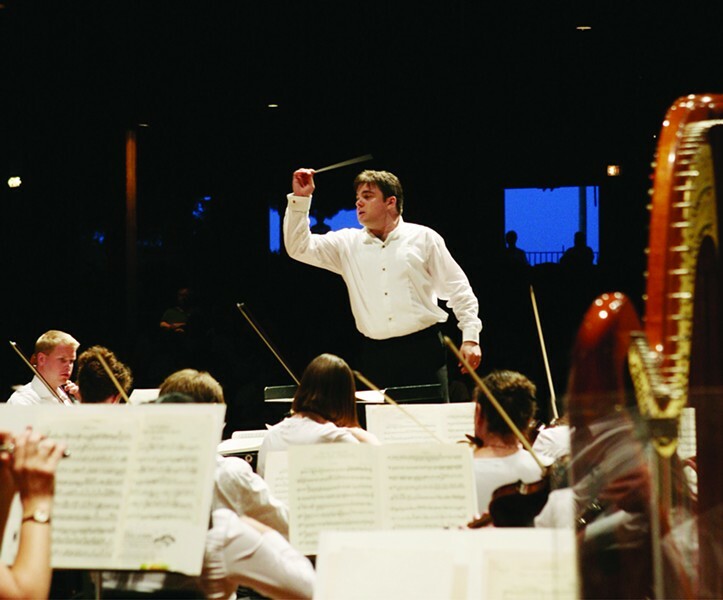 Guest conductor Michael Christie -- Minnesota Opera Music Director since 2012 -- has crafted a smart, cohesive, and accessible playlist of mostly Italian masters, and in the process, has presented the RPO in a new, refreshing light. Giovanni Gabrieli's "Canzon per sonar septimitoni a 8" -- one of two compositions receiving their RPO premieres this week -- invoked the intimacy of chamber music with two separate quartets comprised of trumpet, clarinet, horn, and trombone, which flanked the orchestra on either side of the stage. There is something about the call-and-response of antiphonal music that is both intrinsically merry and magisterial. While most of the piece was marked by precision and clarity, some notes proved somewhat unwieldy, with occasional moments of flubbed attacks and iffy intonation detracting from what was an otherwise ideal concert opener. Rather than perform each violin concerto of Antonio Vivaldi's "The Four Seasons" consecutively, Christie chose to alternate between the seasonal concerti and other Baroque works that corresponded with the appropriate time of year. Alessandro Scarlatti's "Glory of Spring Overture" -- with its brisk tempo and stately demeanor -- was sandwiched between "Spring" and "Summer." The supremely elegant "Christmas" Concerto in G Minor by Arcangelo Corelli preceded "Winter." Christie's approach as conductor was almost minimalist. The antithesis to ostentation, he emphasized subtlety and sensitivity to articulation over outsized gestures and grand, sweeping phrases. The chamber orchestra assembled -- as led by Christie -- knew when to blend seamlessly with concertmaster and Vivaldi soloist Juliana Athayde, and conversely, when to take a back seat. With pristine tone and exquisite control, Athayde projected quiet charisma, and her virtuosity shone with abundance, without upstaging the musicians behind her. During "Summer," Athayde traded lithe, cascading runs with the orchestra that were nothing short of dazzling. The inspired interplay between Athayde and principal cellist Ahrim Kim had revelatory, raw energy to it -- later taken up by the entire ensemble. Deftly oscillating between delicacy and aggression, the RPO delivered a nuanced, poignant performance of the first order. Closing with W.A. Mozart's Symphony No. 41, also known as "Jupiter," Christie and company maintained the fresh immediacy of the previous selections. Christie's facility with the full range of dynamics injected a particular vibrancy into Symphony No. 41. Phrases popped, and articulations had extra bite. In the second movement, "Andante cantabile," Mozart was at his most lyrical and Romantic. Warm, mellifluous melodies moved with serpentine fluidity. It made me wonder what Christie might do with the music of Tchaikovsky. As a whole, this was an exquisite performance from the RPO. There was a noble and triumphant air throughout -- a great fit for the holidays. But perhaps most importantly, the orchestra played with a robust edge, a clear sign of the RPO at its best.